Are you reacting to the current business landscape or are you ahead of the curve? Staying on the pulse of what is happening and what will happen is always a challenge for business owners and entrepreneurs…but one that needs to be successfully managed. 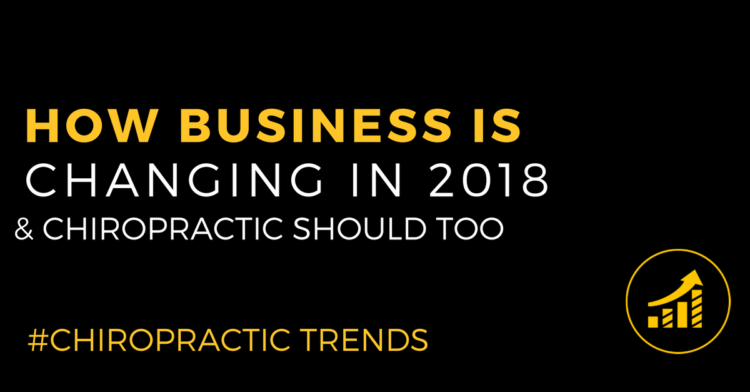 After nearly 10 years of working with Chiropractors, coaching with some of the best entrepreneurial organizations and growing our own businesses, we feel confident in making predictions for 2018 that will help you be on the offensive this year! More than ever, interactions are happening online and through automation, leaving the door wide open for more community development and personalization. We give you examples of projects worth adding to your initiatives list. Less and less simply having a good product will do. There is a need for more emotional engagement and story telling, brand development and positioning. We tell you what platform this works best on and some strategies to get you started. We all love Facebook (or should!) for business purposes but changes to the Facebook algorithm are making your ability to pivot and stay on top of those changes more vital than ever. Learn what Facebook has done, why and what that means to your business. Since brands tend to see better engagement on Instagram than any other social media platform, and because of great advertising controls, Instagram is poised to become the go-to channel for brands interested in social media marketing. How do you get started? What have we learned from our Instagram marketing that will give you a boost in 2018?